Helvellyn is a formidable mountain, not far from the hotel, on the western tip of Ullswater lake. 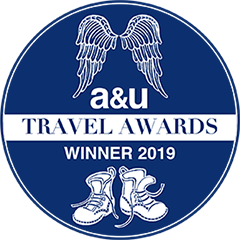 Adventurers from all over the world come to tick it off their list, so it was no surprise when the ascent via Striding and Swirral Edges was chosen by Julia Bradbury, and the team from Britain’s Favourite Walks, as the best walk in the country in 2018. 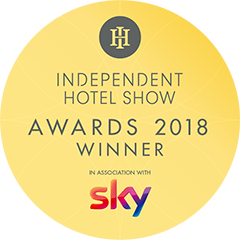 However, in winter it is a far more serious proposition and should only be attempted by experienced winter walkers, who are comfortable with ice axe and crampons on exposed terrain. 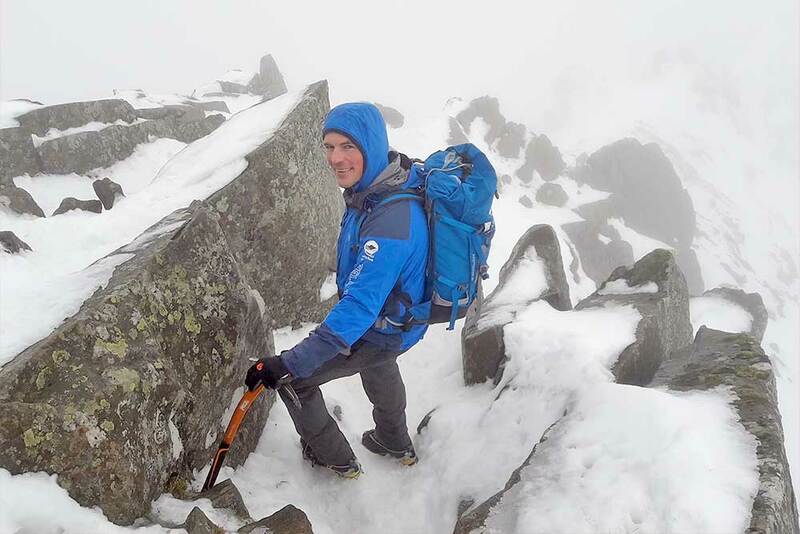 A man who is no stranger to adventure or Helvellyn, and is the most recently appointed Fell Top Assessor, Zac Poulton, talks to us about getting up Helvellyn in winter. The Fell Top Assessor service is now entering its 31st season of operation. Much as we do today, in 1988 the assessors would make a daily ascent of Helvellyn to record the weather and snow conditions. Back then, it was back down to a red telephone box with a pocket full of coins to leave a recording on the Weatherline answer phone. 3600 plus ascents later we’ve moved with the times and our reports and images are now posted on the web and Twitter. The weather observations are also fed back to the Met Office and are used in their specialised mountain forecasts. Our aim is to give walkers, climbers and skiers condition reports and advice for them to make good decisions and summit safely. It’s not just humans that we help. 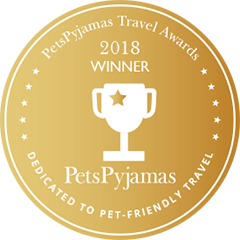 Last winter, two dogs went missing near the summit of Helvellyn. The owners spent a long time looking for them, but were forced to admit defeat and descend the mountain. The story was published on social media and the next day there were a number of volunteers, who’d travelled from far and wide, out looking for them. Late in the day, the dogs were spotted, trapped under the cornice (snow overhang) that usually forms just to the east of the summit trig point. Mountain Rescue were called, but with darkness rapidly approaching a team of volunteers including the Fell Top Assessor swung into action. Protected by a short length of rope, they were able to cut through the cornice and safely rescue the dogs from their exposed position. Winter is now firmly established on the fells. The classic winter mountaineering day on Helvellyn is a round of the Edges. The exposed knife edge ridge of Striding Edge leads to a steep headwall and the summit plateau. Swirral Edge is usually climbed in descent being shorter, but just as exposed and tricky. The easier routes tend to be from Thirlmere on the west of the mountain. The Swirls and Wythburn paths are probably the most popular, but each has its hazards. In the 2017/18 winter season the assessors recorded gusts of 82mph and a wind chill of -23°C. 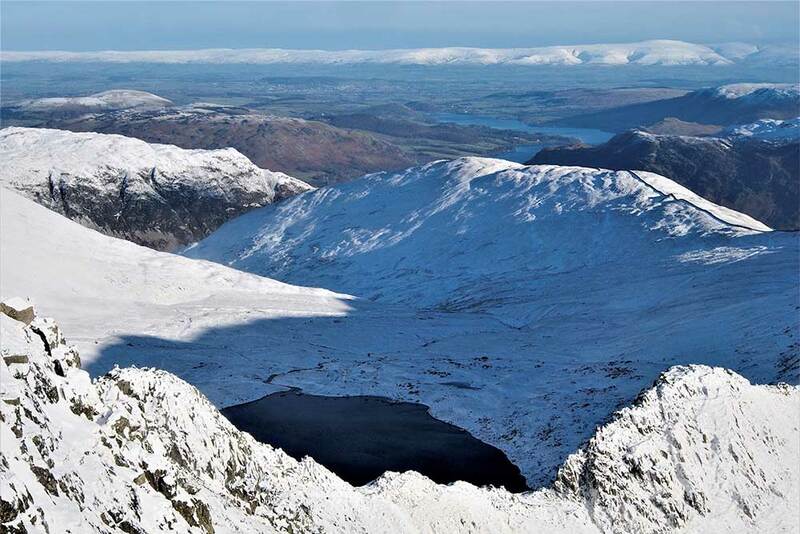 It may surprise you, but avalanches can and do happen in the Lake District. Conditions are usually far more benign, but when the weather deteriorates to this extent then it can be life threatening. Winds this strong will blow an adult over with a high risk of injury. Wind and snow can create a whiteout which is like walking inside a ping pong ball and it’s easily possible to walk over an unseen edge or get hopelessly lost. Digest the forecasts and the condition reports so you have a good idea what you will experience. There is a wealth of information on the web. Of course, the first port of call should always be our own Lake District Weather Weatherline. This will provide you with a specialised weather forecast for the summits, observations, advice and photos from the previous days and sunrise and sunset times. Make sure you have the right equipment for a winter ascent including waterproofs, warm layers, hat & gloves, winter boots, ice axe & crampons, map & compass, head torch, food & drink and an emergency shelter. Goggles can be very useful on windy days. Pick a good day, but be prepared to turn back if you’re not happy with anything. If you’re new to the winter environment or would like a refresher then consider booking onto one of our one day Winter Skills courses. At this time of the year the Lake District only receives just over 7 hours of daylight. You should carry a head torch just in case, but it’s worthwhile making an early start and aim to be back in the pub or coffee shop before it’s needed. Conditions on the hill can change rapidly, so walkers should be aware of their surroundings. There can be localised effects where the wind is accelerated through gaps or over ridges. If you are not happy with the conditions it is always wisest to turn back rather than push on. There are days of high winds or the threat of avalanche where even the Assessors make the sensible decision not to visit the summit. This season one of the assessors was reduced to crawling on the Wythburn path and made the sensible decision to turn around at 850m. The mountain will always be there and you can always come back when the conditions are more favourable. If things are taking a turn for the worse then take a moment to think about the best course of action. Put all your layers on, find some shelter, eat some food and have a drink. The Lake District is lucky to have 12 Mountain Rescue Teams, run entirely by volunteers and donations. Two of the busiest, Patterdale and Keswick, cover the area around Helvellyn. 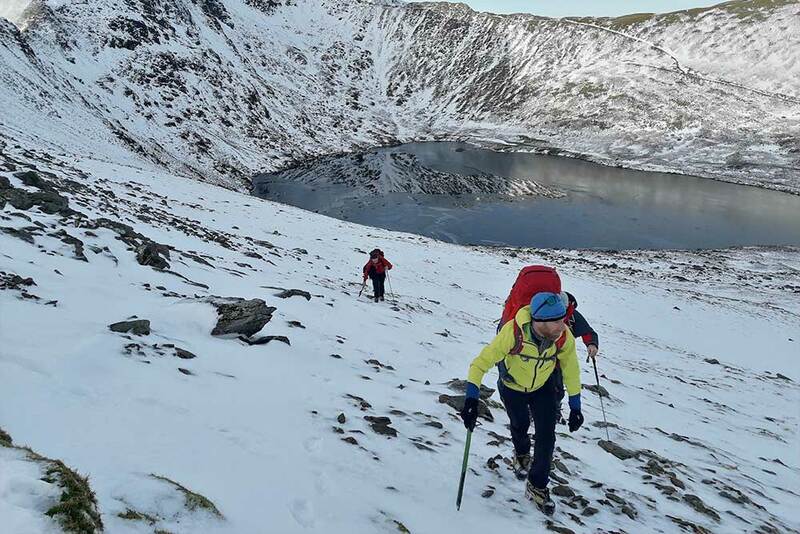 The majority of the incidents involving winter walkers dealt with by Mountain Rescue have occurred on Swirral or Striding Edge ridges or on Swirls Steep on the Thirlmere side of the mountain. To call Mountain Rescue dial 999 and ask for the Police and then Mountain Rescue. You can also register your phone to enable 999 text calls, ideal when the mobile signal isn’t very good. Our winter skills courses are aimed at summer walkers who would like to venture out in winter. It’s a relatively physical day as we usually hope to summit Helvelllyn or a similar peak, but if you are able enjoy a couple of consecutive summer days walking in the hills then you should be fine. We focus on moving safely and efficiently in the winter environment, so its crampons on and an ice axe in your hand. We also look at the basics of avalanche safety and winter navigation. 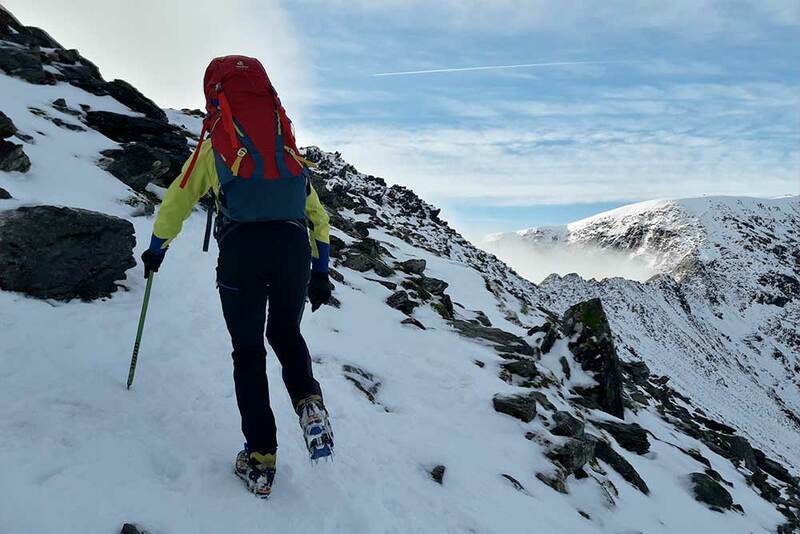 Each course is tailored to the experience and aspirations of the group and we aim to make it a fun and informative day and give folk the confidence to explore the UK mountains in winter conditions. Book now for your last minute break in The Lake District, to explore Ullswater and stay at Another Place, The Lake.